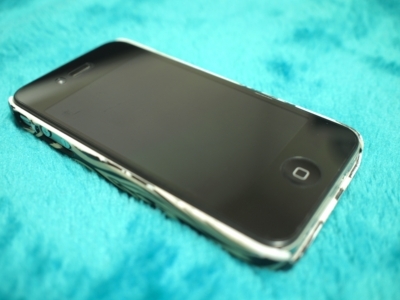 There are superior Display Protection Films and inferior one for iPhone and iPad. I tell you my favorite one that I think No,1 film and mistook choice. This film mane by micro solution Inc in Japan. 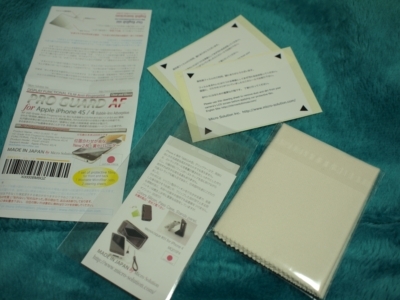 Its contain 2 films (for front panel and back panel), 2 remove dust tapes and 1 cloth. 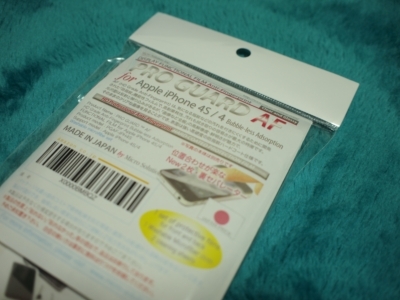 I usually use "PRO GUARD AF for Apple iPhone4s/4". This goods has pretty clear and touchable likes naked iPhone. I don't like anti-clear because it not seems to iPhone. And the inferior one is in this pic. I expected it's good because this package was nice, but so terrible. 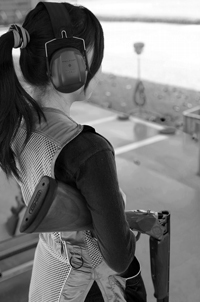 This film was thick moreover became bad sensitive of touch panel. 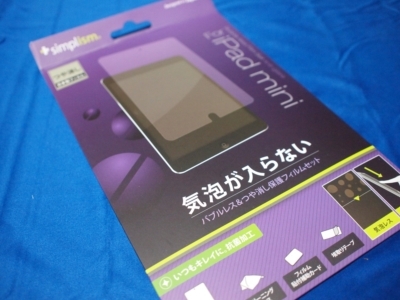 The price was 1880 yen, I think never inexpensive. What a shame! I wrote e-book using iBookAuther, then I noticed I couldn't preview it. I have to get iPad for its preview...is it Apple merchandising !? 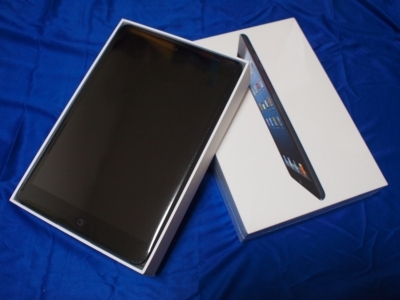 It's too big 7 inch for me, I want 5 inch iPad mini...Which size did you expect ? 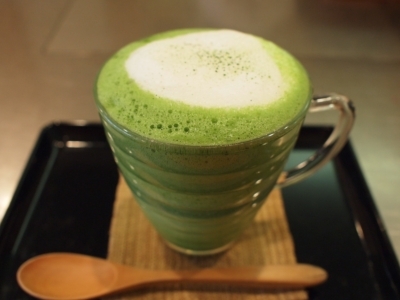 八千代台 和菓子 大こくや [ Japanese sweets shop & cafe "Daikokuya"] you can drink "Maccha latte". Oh! it makes my mouth water!!! but it's just handicrafts. 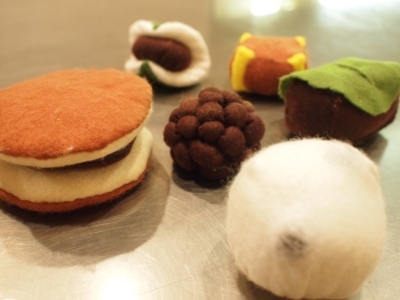 I'm going to introduce a Japanese sweets shop & cafe close to Yachiyo-dai-station. 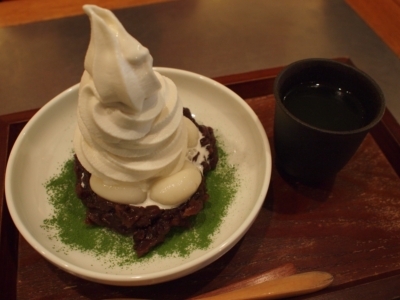 It's a "soft ice cream with rice‐flour dumplings and bean jam". This sweet tower is 550 yen include hot green tea. It's a "soft ice cream and rice-flour dumplings with brown sugar syrup". 2 dumplings ware wore green tea powder and other 2 one were wore soybean flour. It looks cute ! It's a 500 yen include hot green tea. Pour brown sugar syrup upon soft ice cream same as this pic. It's a "soft ice cream and bean jam on the Moffle". 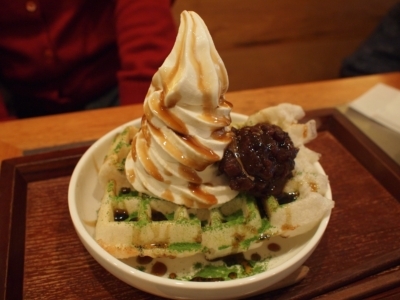 Moffle was made from mochi( rice cake) using waffle irons. 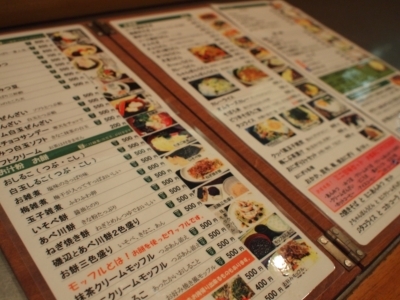 It gave me plenty to eat, 500 yen include hot green tea. Do you know "Maccha Latte". 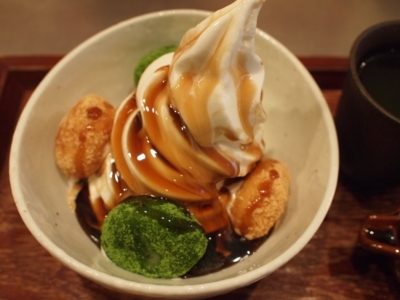 I found this column "40 Tokyo foods we can't live without" in CNN travel. Of course, there is "Maccha latte" in this Japanese sweets cafe. It's a 400 yen. This cafe has not Maccha latte but also authentic Maccha. 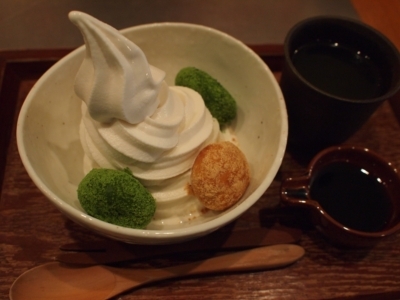 Would you like to try to drink Japanese Maccha and traditional sweets? Actually, we can take lunch here because there are a lot of meals. 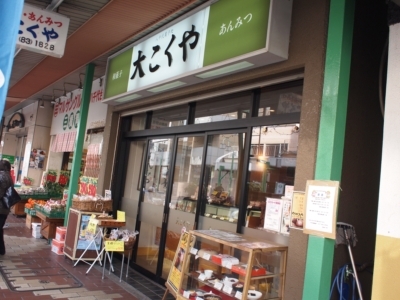 Daikokuya is open from 10:00a.m. to 6:30p.m. ,sundays are close 6:00p.m. Daikokuya's cafe is close 6:00p.m. everyday and last order is 5:30p.m. The day off are every Monday. I met my friend who visited to Germany in his holydays, and he showed me his trip pictures. I've known "Currywurst" for the first time, it's a German typical fast food. I'm a chef who can make several cuisine around the world by only my image! 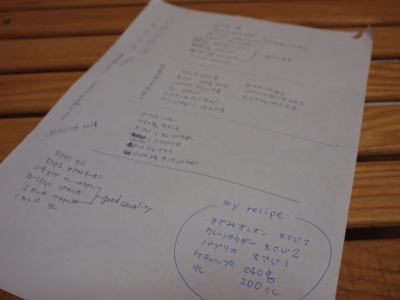 First of all, I chose 4 recipes after I read recipes more than 20 on internet. and I made my currywurst recipe by fusion. 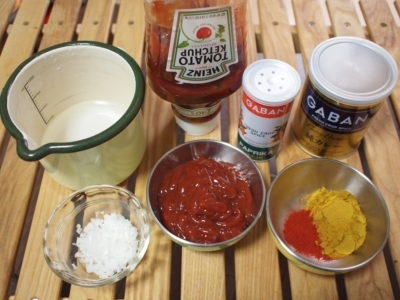 I prepared ingredients of currywurst, Did you have a question about these? Why do you use "HEINZ" ? I think "currywurst is FAST FOOD" and it's a German traditional junk food. If this recipe isn't yummy, I'll retry according to the formal one likes 5 stars restaurant. By the way, do you think it's a toil to measure "2tbs chopped onion" ? 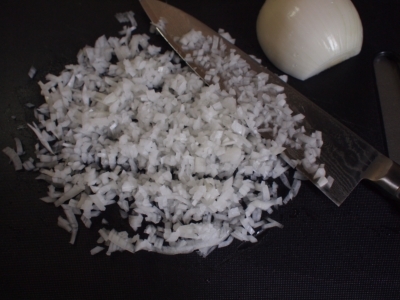 I decided "2tbs chopped onion is 1/6 medium size whole onion" after I made chopped it. so little amount...but DON'T add it for curry sauce. You should make salsa another bowl. Preheated a shallow pan with oil, add chopped onion, fry until it be transparent. 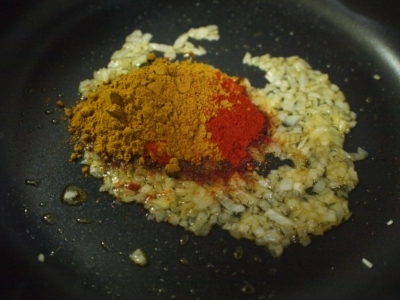 next, add paprika and curry powder into pan, fry to bring out the flavor with low heat. 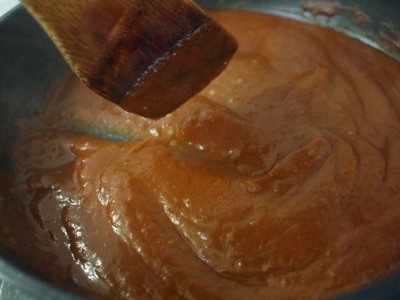 Add HEINZ and water, simmer and sometimes stir to avoid burn. You have to use low heat otherwise your clothes will be cute dot pattern. The curry sauce is already same as above pic. and sprinkle curry powder over them. The french fry is ordinary relish, sometimes it's a roll. My kitchen and your kitchen became Berlin ! more than other European country". My expectation for German is getting bigger and bigger !!!! I found this Youtube, Hip Hop chef is cooking currywurst. His recipe is elaborate way. 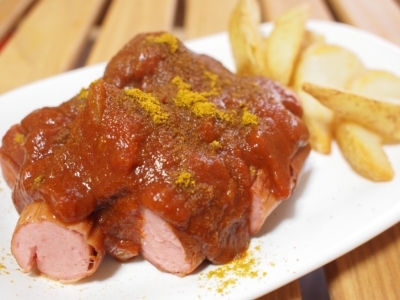 The currywurst is YUMMY both easy recipe and much process one. There is CURRYWURST MUSEUM in German. I wanna be covered with currywurst in German!! !